Arriving back in the UK I was immediately struck by the crap weather, but even more so by the intense traffic congestion, even from the word go. I was suddenly in a van being pelted with cold rain, and trying to negotiate the Plymouth streets bumper to bumper with traffic. It took me almost an hour to get through the town centre and back onto the main road in constant rain. I didn't once see congestion anything like this driving through Spanish towns, everywhere being so spread out and the sun almost always shining. I was soon on the way north, destination, the Yorkshire Dales to meet up with my friend Rob. I can tell you its one hell of a drive after coming off a 24hr crossing from Spain, to drive so far through England in one go - I was going to have to stop for coffee more than once to make it. We had planned to meet up at Blood Red Off Road in Hipperholme where Dave was putting the finishing touches to Rob's yellow Hiace Camper - you may have seen pictures of it on my Facebook page recently..
At the time, the cool roof rack in this pic was still being made, and we spent a fun couple of days camping out in the workshop in the two campers as Dave cut and welded away and we saw the roof rack taking shape. We didn't miss out on sausage baps for breakfast and a memorable evening out at a local pub followed by a great Indian meal, thanks Rob. Thanks too to Dave for welding up my tow bar for me - I needed to swop out the Japanese ball for a 50mm Euro size one. 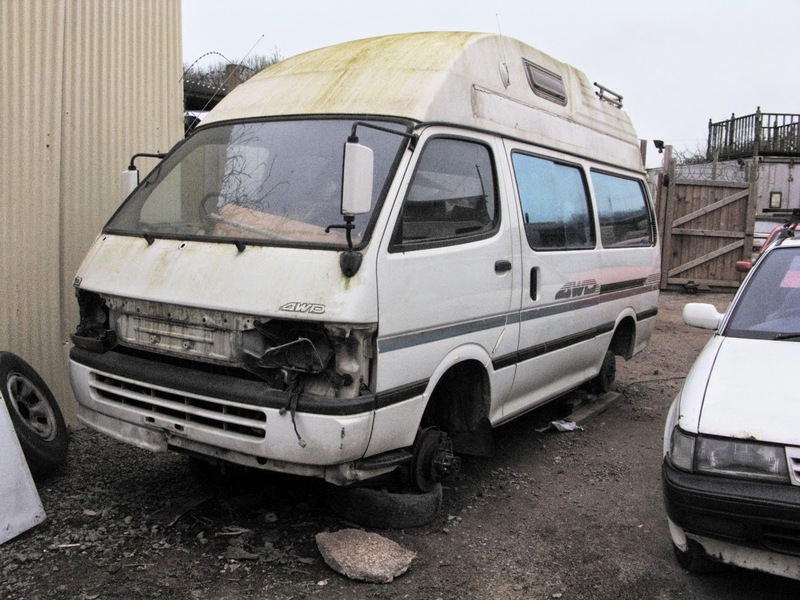 After leaving the workshop, and finally making it back to the Dales, the travelling was not over, and we actually made a run to Bristol to collect an urgent spare part for one of the vans. Knowing of the existence of the camper in the picture below, that was being dismantled for parts, a quick phone call confirmed that the part needed was still on it, so being impatient to get back on the road, a run to Bristol in a Fiesta was in order - it was a long day but we returned with the necessary part. Spare parts galore! Or dwindling fast.. The next day we were off in the direction of Scotland, being no strangers to the road, and enjoying the leisurely pace of the Hiaces compared to speeding along in a car. Chatting on walkie talkies along the route made travelling in separate vehicles a more sociable experience, and there was plenty of craic using CB radio lingo as well. 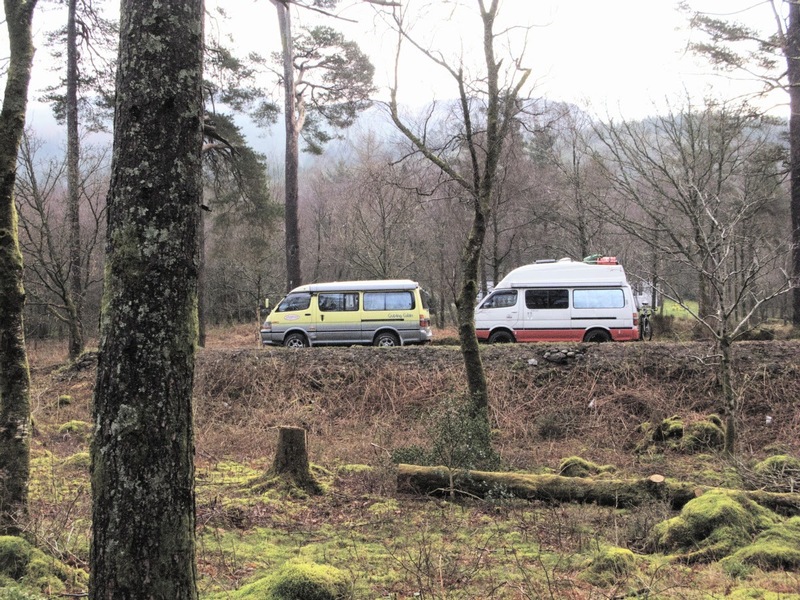 I'd suggested that we take the route via the Dundoon ferry as an alternative to the well known road along Loch Lomond, and not being in any rush to arrive anywhere in particular, we were glad to get into more wild country as soon as possible. 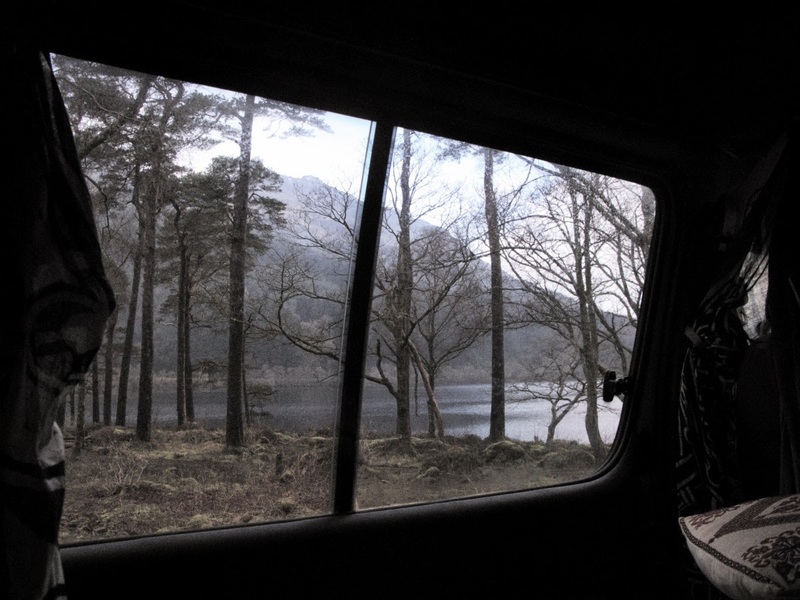 We made it to the last Dundoon ferry crossing in the nick of time, and then in the pitch black we traversed the shores of Loch Eck, looking for a camping spot I'd remembered from last year. After enjoying the coastal drive around Loch Fyne, we spent a few hours in Inveraray. It was a fine day for April and we sat in the sun by the harbour for quite a while. One of those days were the words most spoken are, "what a beautiful day." 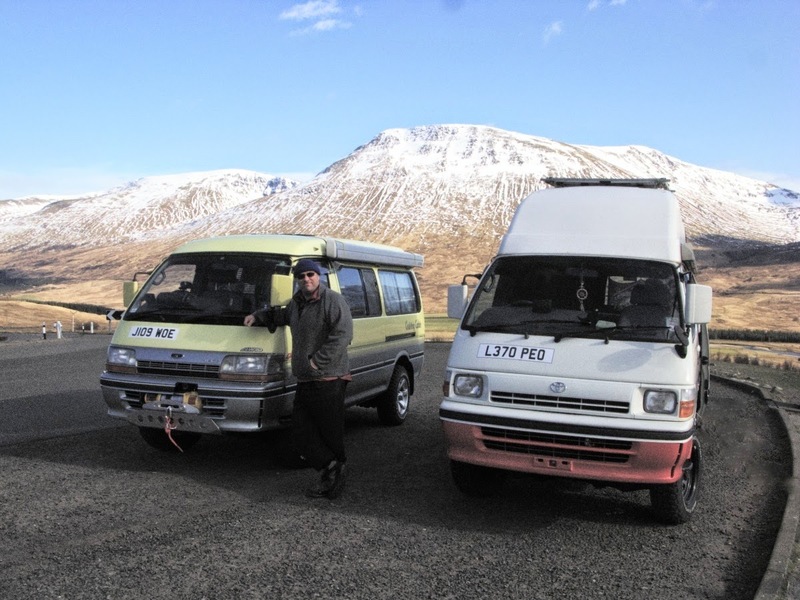 Soon we were on the road to Tyndrum and back onto the more familiar A82, trucking up through the amazing mountain scenery en route to Glen Coe.. 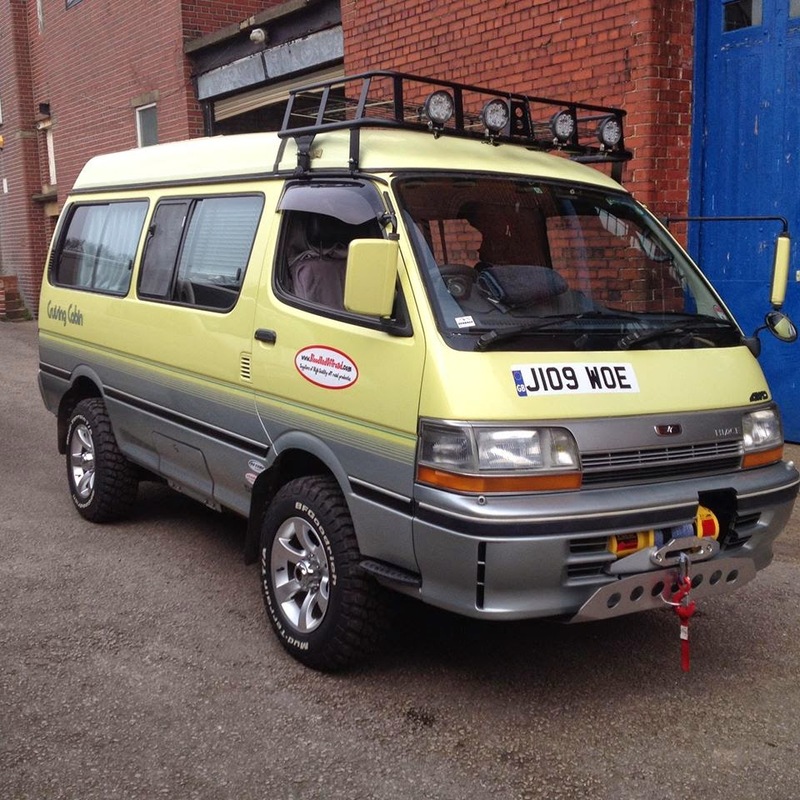 Rob's Hiace looks very good. I have the same model also 4WD which I'm using in Japan. Interested in where he got his winch & roof rack from!